The Federal Home Loan Bank of Des Moines is a member-owned cooperative that provides funding solutions and liquidity to over 1,400 members to support mortgage lending, economic development and affordable housing in the communities they serve. Members include community and commercial banks, credit unions, insurance companies, thrifts and community development financial institutions in Alaska, Hawaii, Idaho, Iowa, Minnesota, Missouri, Montana, North Dakota, Oregon, South Dakota, Utah, Washington and Wyoming, the U.S. territories of American Samoa and Guam and the Commonwealth of the Northern Mariana Islands. 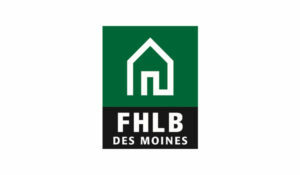 FHLB Des Moines is one of 11 regional Banks in the Federal Home Loan Bank System (FHLBank). Established by Congress in 1932 to support mortgage lending, the FHLBanks are a stable source of funding for approximately 7,400 federally insured depository institutions of all sizes and types. Regulated by the Federal Housing Finance Agency, the FHLBanks are cooperatively owned by their members, operate independently with their own boards of directors and are registered with the Securities and Exchange Commission. FHLB Des Moines members benefit from access to a variety of products and services designed to help lower their funding costs, mitigate risk, improve asset and liability management and meet community credit needs. In addition, FHLB Des Moines contributes 10 percent of its net income each year to affordable housing programs. Grants are awarded to help meet the housing needs of low- to moderate-income individuals and families. The use of these funds also positively impacts job growth and economic development throughout the FHLB Des Moines district.